See a blog for the book. 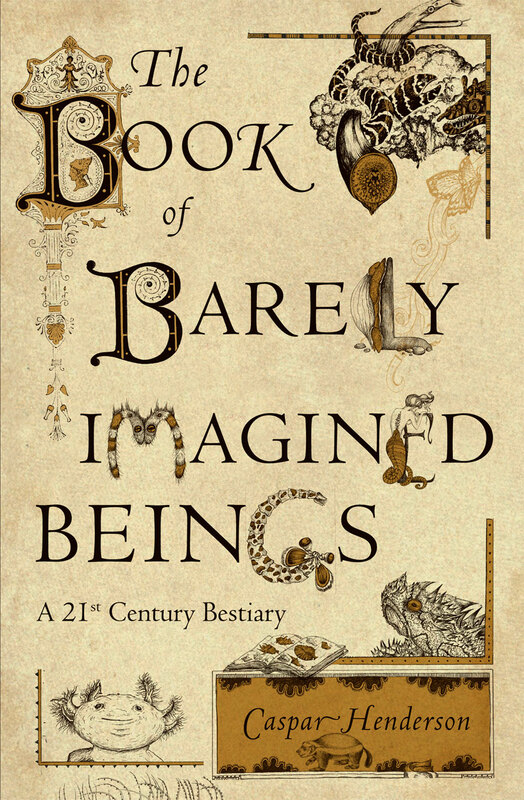 A powerful combination of wit, cutting-edge natural history, and philosophical meditation, The Book of Barely Imagined Beings is an infectious and inspiring celebration of the sheer ingenuity and variety of life in a time of crisis and change. "Tangentially inspired by Jorge Luis Borges’s Book of Imaginary Beings, and assembled like a cabinet of curiosities, journalist Caspar Henderson’s first book highlights what nonhuman species reveal about being human. The disarmingly human face of the Axolotl salamander introduces a reflection on evolution, which wanders into the history of the Spanish conquest of Mexico, before landing on the question of what the Axolotl’s ability to regenerate limbs can reveal about stem cells. It’s an oddly anthropomorphic argument to abandon anthropomorphism, but as exotic salamanders and transparent octopi give way to miniscule water bears, whiskered owlets, and the honey badger, Henderson’s contagious awe of life effortlessly advances his argument. The captivating habits of these beings are given significant scientific backbone, before digressing into a free-flowing discourse." "This readable volume will appeal to the serious reader with broad interests in science, mythology, folklore, and speculation on questions of the human condition."